Willett's MGP-distilled rye is my favorite American whiskey. The single barrels vary, but they always deliver a tremendous and nuanced experience. 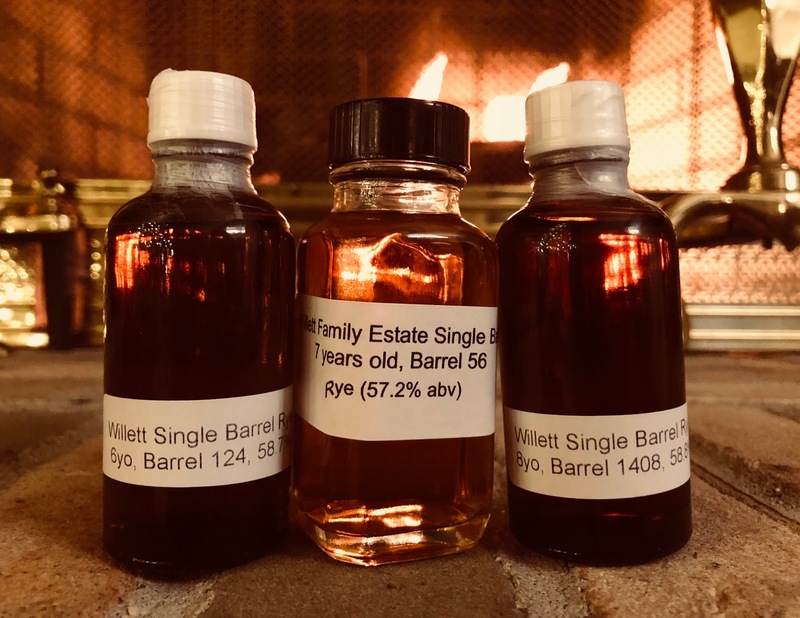 Last week, I did a whole schpiel about the crazy pricing of Willett's single barrel bourbons. I won't do the same for the ryes because I already covered that territory here and here. Needless to say, they ain't selling for $40 a pop anymore. Because they're scarce and because they ain't $40, we no longer open two Willett ryes each year here. Maybe one every two years at this rate. But I was able to align three samples of the current era of WFE single barrels to compare and contrast in one sitting. And, hey, it's even a verticale this time! I'd be lying if I said I didn't feel a burst of melancholy on the last sip. Of the three ryes, this one was most reminiscent of what once was.......those $40-$50 4-6yos we were much spoiled to have four years ago. I'm going to set those romantic memories right over here, so I can continue this post. This is an excellent rye. Each new characteristic, spun out by the grain, merges perfectly with every element that came before. The oak has done its subtle work without intruding. And then finish is right on pitch and unending. Damn.